“Over the weekend, we received some bad news: the Saudi Supreme Court confirmed the death sentences of the 14 young men convicted of protest-related offences. The only thing now standing between them and an executioner’s sword is the signature of King Salman. We’re planning on handing in the petition that nearly 30,000 of our supporters from around the world have signed to the Saudi Embassy in London – but before we do that, we want to ensure as many people as possible have signed on and voiced their opposition. This could be our last chance to make the Saudi government reconsider their decision. 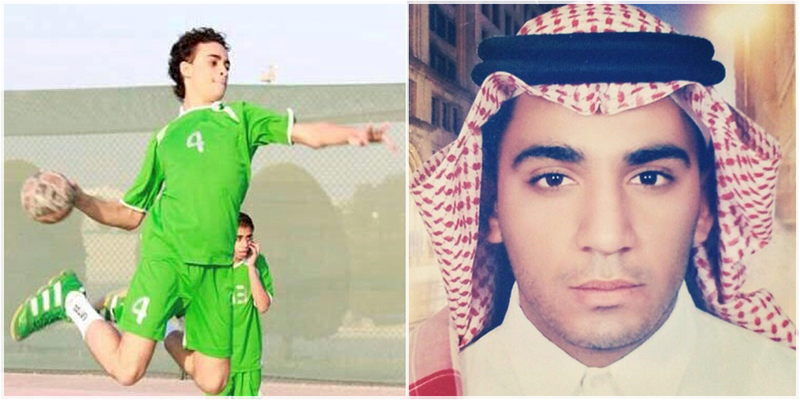 Please sign the petition and call on the Saudi government to stop these executions. One of those facing execution is Mujtaba al-Sweikat. Mujtaba had always wanted to study in the US, and was thrilled when he was accepted to Western Michigan University. A keen athlete who also enjoyed acting and making his own short films, he was excited to move to America and was counting down the days until he could begin his new life there. That new life was snatched away from him when Saudi police arrested him at the airport and took him away to be beaten, tortured into signing a false ‘confession’ and sentenced to death. “14 people sentenced to death on protest charges in Saudi Arabia have been prepared for execution and could face beheading within hours. They include a disabled man and two sentenced to death as juveniles. Munir Al-Adam was born with impaired sight and hearing. In their efforts to extract a “confession” from him, Munir’s captors tortured him so badly that he was rendered completely deaf in one ear. Mujtaba’a al-Sweikat was just 17 when arrested at the airport on his way to take up a place at university in the US. He was burnt with cigarettes and tortured so savagely that his shoulder was broken. He was denied medical care and sentenced to die on the basis of the forced “confession”. Please share widely. I find it shocking that any government is willing to take the lives of anyone, let alone a disabled person and other young men for any reason. These young men should have their whole lives to look forward to, please sign the petition. Rats have such a bad reputation don’t they. Few people care about them. They are classed as vermin, a word I do not like as no animal is vermin, all animals are simply living according to their nature likely oblivious to any real or perceived detriment to human beings. Below you can read about and view photographs like the one above of rats by Diane Odamizer. “I have been taking pictures of pet rats for years hoping to break the negative image that is often associated with these lovely animals. Rats are highly intelligent creatures. This article discusses empathy in rats. 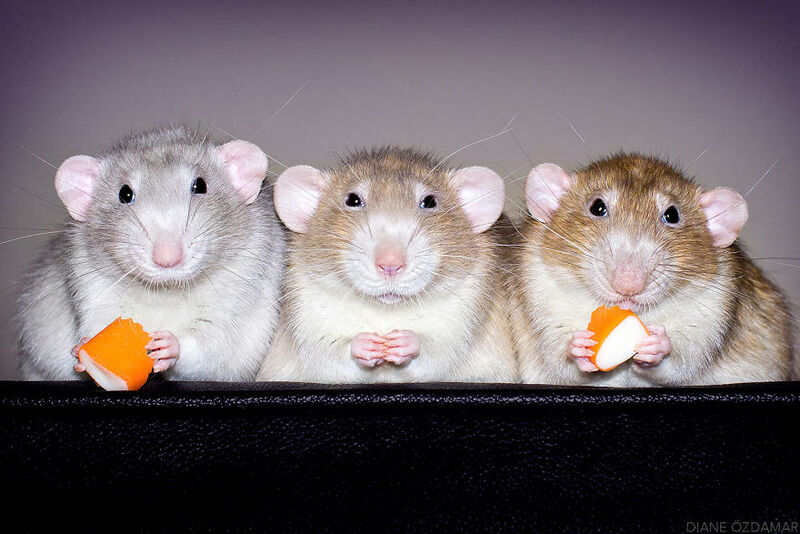 In the next link you can read more about rats and mice and actions you may take to help them along with more photographs. “Reasons why we should defend rats and mice who are probably the most neglected and abused animals on the planet. Soon it will be the so-called Glorious 12th here in the UK, this being August 12th which begins the shooting season, when men , usually men but increasingly women, go out onto the moorland armed to the teeth and use tiny birds as live targets, shooting them out of the sky after terrifying them into leaving the safe cover of their habitats by what is called grouse beating – a method to drive them towards the shooters using flags, sticks, and other devices. During 1st October to 1 February, this barbaric behaviour is further added to by the commencement of the pheasant shooting season.Add to this deer hunting/stalking in some way or another depending on the breed or gender of deer occurs throughout most of the year. Rabbits of course can be killed with little or no restrictions all year round. What a shocking state of affairs exists when people can legally kill members of another species simply for fun, wantonly and callously take the lives of other sentient beings who have as much right as we to live out their natural life spans. Hunting, shooting, deer stalking are all the same thing namely the killing or massacre of other living beings, the different classifications are irrelevant to the unfortunate animals who suffer pain and death as a result of this inhumane pastime. What makes people wish to go out into wild places and with deliberate intention shoot helpless defenceless animals? More to the point can such people change? “What is it but deliberate massacre when thousands and tens of thousand of tame, hand-reared creatures are literally drawn into the Jaws of death and mown down in a particular brutal manner? A perfect roar of guns fills the air, louder tap and yell the beaters, above the din can be heard the heart-rendering cries of wounded hares and rabbits, some of which can be seen dragging themselves away, with both hind legs broken, or turning round and round in their agony before they die. And the pheasants ! They are on every side, some rising, some dropping, some lying dead, but the greater majority fluttering on the ground wounded, some with both legs broken and a wing, some with both wings broken and a leg, others merely winged, running to hide, others mortally wounded gasping out their last breath of life amidst the fiendish sounds which surround them. And this is called sport!… Sport in every form and kind is horrible, from the rich man’s hare-coursing to the poor man’s rabbit-coursing. From reading the above you may be surprised to learn that Florence Dixie, a Scottish traveller, war correspondent, writer and feminist, once participated in blood sports with great enthusiasm including big game hunting. However during the 1890s her views on what is often termed field sports changed quite dramatically, in her book The Horrors of Sport she condemned blood sports as cruel. We owe much to animals, and their rights are still shamefully neglected, while wild animals are absolutely unprotected. Many women are heedlessly, and others ignorantly cruel in this particular. … Experience has taught me the cruelty and horror of much miscalled sport. Wide travel, much contact with the animal world , and a good deal of experience in a variety of sports have all combined to make me ashamed and deeply regretful for every life my hand has taken. During her early life and travels Dixie enjoyed hunting, raging from fox hunting to hunting wild life in Patagonia as the following extracts describe. During 1878-1879 Dixie travelled with her husband, two of her brothers and a friend in Patagonia in South America. There, she hunted big game. Below is an extract from Across Patagonia in which she describes with gusto the chase and killing of an ostrich. Fortunately, beyond a shaking, I am unhurt, and remounting, endeavour to rejoin the now somewhat distant chase. The ostrich, Gregorio, and the dog have reached the plain, and as I gallop quickly down the hill I can see that the bird has begun doubling. This is a sure sign of fatigue, and shows that the ostrich’s strength is beginning to fail him. Nevertheless it is a matter of no small difficulty for one dog to secure his prey, even at this juncture, as he cannot turn and twist about as rapidly as the ostrich. At each double the bird shoots far ahead of his pursuer, and gains a considerable advantage. Away across the plain the two animals fly, whilst I and Gregorio press eagerly in their wake. The excitement grows every moment more intense, and I watch the close struggle going on with the keenest interest. Suddenly the stride of the bird grows slower, his doubles become more frequent, showers of feathers fly in every direction as Plata seizes him by the tail, which comes away in his mouth. In another moment the dog has him by the throat, and for a few minutes nothing can be distinguished but a gray struggling heap. Then Gregorio dashes forward and throws himself off his horse, breaks the bird’s neck, and when I arrive upon the scene the struggle is over. The run had lasted for twenty-five minutes. Florence Dixie eventually became “haunted by a sad remorse” for the death of a beautiful golden deer of the Cordilleras, who was unusually tame and trusting. After this time Dixie’s views on field sports changed dramatically, and in her book The Horrors of Sport she condemned blood sports as cruel. She eventually became a vegetarian and an advocate for animals, she wrote “A Prayer for Dogs” to help people realise the necessity of the proper treatment of domestic animals and the “The Union of Mercy”to help teach children not to torment birds and adults not to wear fur. In November 1989, I was shot by a deer hunter, while on my own property. The irresponsible hunter left me for dead, and my twelve year old son loaded me in a truck and drove me 40 miles to a hospital. That didn’t dampen my enthusiasm, though, and is not the reason I quit, but it did give me a solid taste of what the animals endure. I guess I just started to understand that the animal I was looking at through a scope was not just a target, but a living thing. A thing that suffered when shot, a thing that I had no right to kill, though I had the privilege to do so, by virtue of paying another person a fee for a license. Think about that. The animal is minding his own business when you go into a store, pay a fee and walk out with a license to kill the animal, what a deal. I shot the last animal that will ever fall to my gun in November 1992. I hunted until January, 1997. In five years, I discovered I could love the outdoors, and it’s experiences, which I still dearly enjoy, without killing. The guns stay at home when I take to the field now, though I keep the rust off them by frequent trips to the range to break clay targets or make little groups of holes in paper, and I have turned more to shooting competition for satisfaction and achievement. 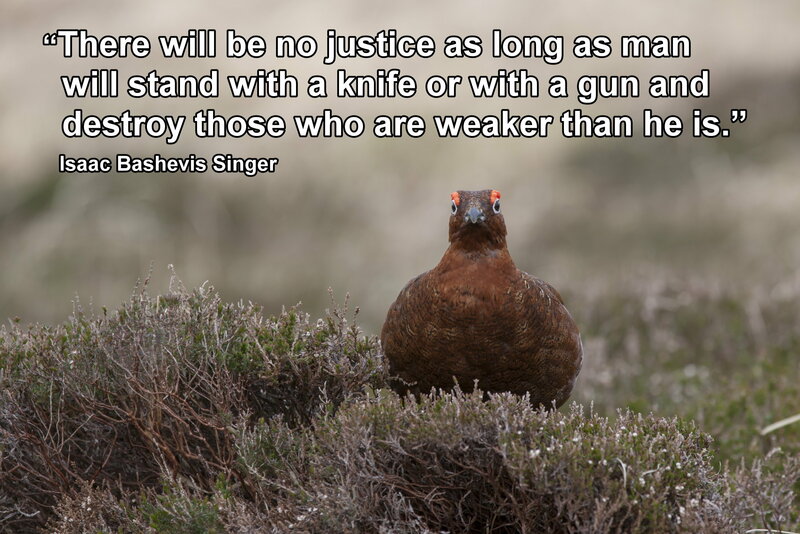 Whether it is foxes, deer, grouse, pheasants or rabbits and hares it is time to end the killing. No country can claim to be ethically progressive while it allows and even encourages it citizens to kill animals simply to satisfy some abhorrent pleasure. Hunters and others involved educate yourself about hunting. Consider a more humane pastime. Hunters make up many excuses to justify their pastime. However, cruel, unnecessary killing—which is what hunting is—has no justification. More and more people are opposed to hunting. “With hunting firmly back on the agenda, a Bristol group who make it their business to disrupt fox hunts say they are ‘snowed under’ with new requests to join. This new film iAnimal – The Dairy Industry in 360ºnarrated by Evanna Lynch, who starred as Luna Lovegood in Harry Potter, shows unimaginable suffering of cows and their calves on dairy farms, where a cycle of cruelty affects entire families. Warning: Contains graphic content which some people will find upsetting. The latest virtual reality film by Animal Equality, is already helping expose the secretive dairy industry for what it is – a vicious cycle of cruelty. “Evanna Lynch’s character in Harry Potter, Luna Lovegood, was praised for speaking uncomfortable truths when no one else would, and Evanna is no different. In our new film, she guides you on a journey few will ever see in person. iAnimal puts you inside the same tiny hutches that calves are trapped in for weeks or months at a time. And, through the lens of the iAnimal headset, you stand helpless as a cow – who has spent years being exploited for her milk – faces a terrifying death in the slaughterhouse. Though the reality these sensitive animals face is disturbing, it is crucial that people learn the story behind every glass of milk. And thanks to compassionate people like you and Evanna who help support iAnimal, we are changing – and saving thousands of lives every month! The dairy industry is brutal and unnecessary. Cows milk is not a natural diet for human beings. Furthermore no animal drinks milk after weening and no animal drinks the milk of another species. The use of milk in so many products is so widespread it occurs even in the most unlikely of food such as in some types of crisps. Yet we can manage without it and in fact be better in health – did you know that rather than be an ideal supplement for calcium it actually increases calcium loss from the bones and increases fracture risk. I have been vegan now for about six years after being vegetarian for about eighteen and with few exceptions there is virtually nothing that cannot to adapted to a vegan diet by using plant based milk. 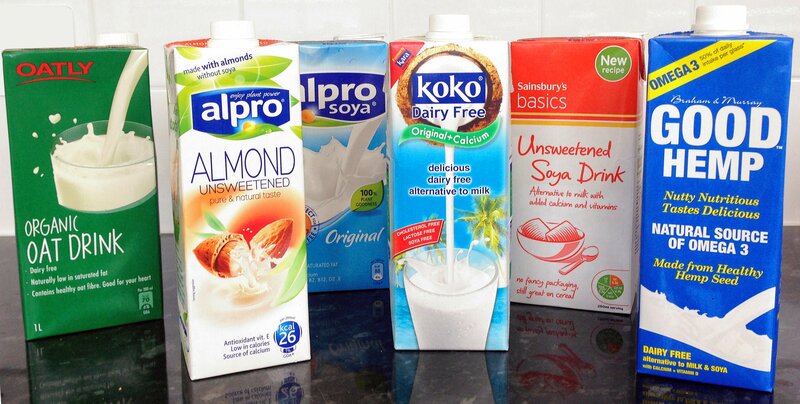 You can replace milk by using the many plant based milk products available such as those in the picture below. You can drink them just like cow’s milk, pour on your breakfast cereals and into your coffee. You can use in baking just the same way as cow’s milk. The victims of Grenfell Tower didn’t just die. Austerity, outsourcing and deregulation killed them – just as Victorian Manchester killed the poor then. While in Victorian Manchester, Friedrich Engels struggled to name the crime visited on children whose limbs were mangled by factory machines, or whose parents were killed in unsafe homes. Murder and manslaughter were committed by individuals, but these atrocities were something else: what he called social murder. “When society places hundreds of proletarians in such a position that they inevitably meet a too early and an unnatural death, one which is quite as much a death by violence as that by the sword or bullet; its deed is murder just as surely as the deed of the single individual,” he wrote in 1845, in The Condition of the Working Class in England. 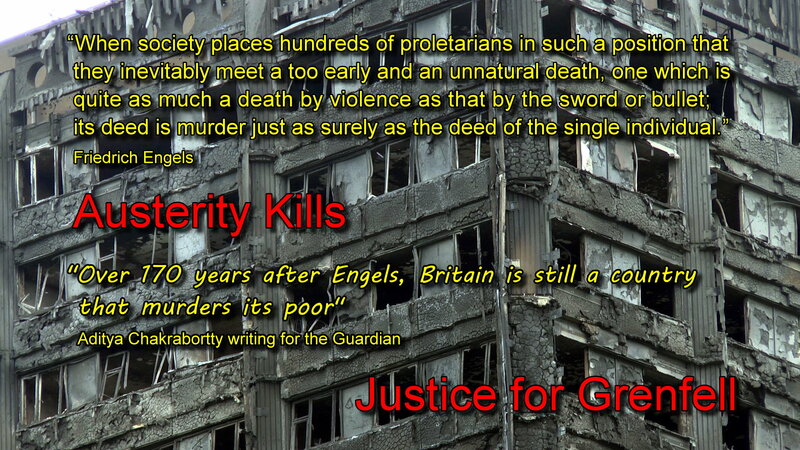 Over 170 years later, Britain remains a country that murders its poor. When four separate government ministers are warned that Grenfell and other high rises are a serious fire risk, then an inferno isn’t unfortunate. It is inevitable. Those dozens of Grenfell residents didn’t die: they were killed. What happened last week wasn’t a “terrible tragedy” or some other studio-sofa platitude: it was social murder. While in Victorian Manchester, Friedrich Engels struggled to name the crime visited on children whose limbs were mangled by factory machines, or whose parents were killed in unsafe homes. Murder and manslaughter were committed by individuals, but these atrocities were something else: what he called social murder. “When society places hundreds of proletarians in such a position that they inevitably meet a too early and an unnatural death, one which is quite as much a death by violence as that by the sword or bullet; its deed is murder just as surely as the deed of the single individual,” he wrote in 1845, in The Condition of the Working Class in England.Over 170 years later, Britain remains a country that murders its poor. When four separate government ministers are warned that Grenfell and other high rises are a serious fire risk, then an inferno isn’t unfortunate. It is inevitable. Those dozens of Grenfell residents didn’t die: they were killed. What happened last week wasn’t a “terrible tragedy” or some other studio-sofa platitude: it was social murder. Austerity killed the victims of Grenfell – the deadliest fire in Britain since the country began keeping records at the turn of the 20th century, claiming at least 87 victims – as it has killed the victims of cruel Tory welfare reforms, and those who have died as a result of cuts to the NHS Austerity will continue to kill the most vulnerable members of our society while the small majority continue to sanction by their vote the gravely unjust treatment of poor people. Behind austerity is the greed of the rich who get tax cuts at the expense of the poor/working class, greedy exploitative employers who want employees to literally work for nothing – there are few laws to protect workers. The list of exploitation of the poor is lengthy and by far the worst example is the Grenfell tower. Eighty people died in the fire because of pure unadulterated greed for a grand saving of £2 a square metre for cladding, about £5,000, of an £8 million refurbishing contract, cladding which was banned in the USA. Further tests show that cladding from 190 tower blocks in 51 local authority areas across England is unsafe and there is a 100 percent failure rate in fire safety tests on cladding used in public high rise buildings. The British government did not ban the cladding used at Grenfell. Thanks to cuts to local councils, and the slashing of red tape, building inspection has been gutted and privatized. The recent refurbishment of Grenfell was sub-contracted, and a fire-resistant cladding alternative was jettisoned in favor of the cheaper option. Tory economic polices are designed to move money from the poor to the rich and in the process people are dying. How many more people have to die before those who vote Tory finally decide enough is enough! The investigation into the Grenfell tragedy must be FULLY TRANSPARENT and allow the MEANINGFUL PARTICIPATION of the affected residents, their families, and the surrounding community. The government cannot be allowed to cover up any uncomfortable revelations about negligence and poor planning of the Grenfell estate by the Tory-run Royal Borough of Kensington & Chelsea. The government were warned time and time again of the fire risks in blocks of flats like this. But these warnings were ignored. Now, pressure is growing for the government to change the law to make buildings like Grenfell Tower safer when there is a fire. We, the undersigned, call on the Government to announce an immediate amnesty, with permanent residency, for surviving occupants of Grenfell Tower. You may also want to write to your MP and express you concerns, your anger and outrage. Please be polite. The fire’s victims were caught in the crosshairs of public cuts and a housing crisis. BENEFIT TALES -stories from the frontline of benefit changes in the UK. The rise in tax breaks for the ultra-rich and austerity measures for everyone else has left Britain on the brink, says Mail Opinion. The series includes true stories, information and accounts which show that animals are self aware sentient beings. 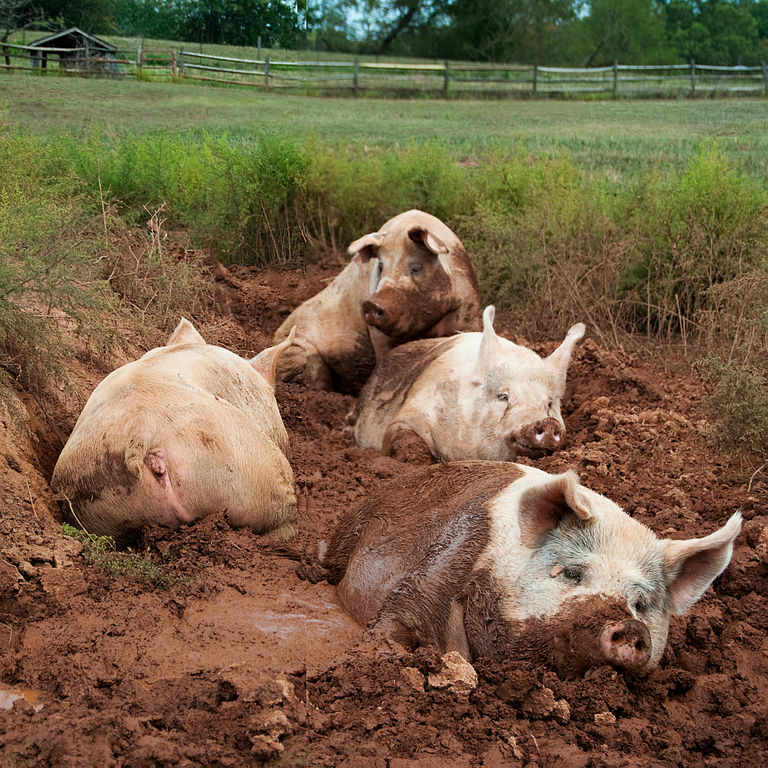 Yorkshire pigs wallow in mud at the Poplar Spring Animal Sanctuary in Poolesville, Maryland. Note: The link to the video included in the above webpage is no longer working. You can watch the video below, this is the full documentary and lasts 52:21 minutes. Pigs, along with chimps, dolphins and elephants, are in the top five most intelligent animals, according to experts. Fact. Pigs are more intelligent than either your cat or dog, they are placed as the fourth most intelligent creature on earth. Yet few people know very much about these much maligned and misunderstood animals. Pigs are clever creatures with an intelligence way beyond that of a three year old human child. Pigs have good memories, they can recognise and remember up to thirty other pigs. Did you know that pigs have a good sense of direction and are able to find their way over long distances? They can remember where food is hidden and by watching each other they learn where food is located. Scientists at the University of Bristol found that showing one pig where food was hidden could benefit others in the group; instead of looking for their own food the other pigs having noticed that their companion had located food would follow his lead. Pigs can respond to their own given name within 7 days of birth. During similar research it was found that pigs can respond to verbal communications. Indeed they are remarkable creatures, insightful, curious , fastidious, inquisitive, social, companionable, compassionate, intelligent and ingenious. Capable of considerable ingenuity they can problem solve better than your dog. Research has discovered that Pigs also have what psychologists call a theory of mind, Theory of mind – they seem to have an understanding of what is going on in the mind of other pigs and make decisions and act accordingly. This type of thinking is usually thought only to exist in man and apes. Pigs it seems are masters of deceit and, according to researchers at Bristol University, pigs deliberately mislead other pigs so as to gain more food. Sheep might be dumb … but they’re not stupid | UK news | The Observer. Pigs are highly social animals, they sleep together huddled in nests and while they sleep they love to cuddle up close to one another nose to nose. Pigs also greet other pigs whom they know by rubbing noses much in the way we would shake hands. Pigs are highly co-operative in social groups and show affection by grooming each other. Very much like us, and indeed other animals, they establish social groups and are capable of evaluating the behaviour of other members of the group understanding which of their number are more aggressive and dominant. In the wild sows form stable family units led by a matriarch with her children and female relatives. Pigs are excellent mothers with a deep affection for their piglets, the bond of a mother and her offspring is as strong as that of any human. In her natural habitat, before she gives birth the mother pig builds a large nest to protect her young, she is very careful about both the quality of the nest and its location, in some instances she may walk for three to six miles to find a suitable place to construct her nest, taking as long as six hours to do so. Here in this carefully selected secluded place she will give birth to her piglets and protect them after they are born for about two weeks, after which time the new family leave the nest and return to the rest of the herd, over the following twelve weeks the piglets are gradually weaned and begin to eat solid food. Pigs are very vocal creatures and have a wide range of communicative calls consisting of grunts, squeaks, snarls and snorts. These are not random noises with no meaning as many people are apt to think, although incomprehensible to us these noises communicate a variety of emotional states, intentions, warnings and other messages important to pigs and what is central to thier way of life. For instance a lactating sow has a special call which summons her piglets to suckle, piglets keep in contact with each other and their mother by grunts and squeals. Pigs are affectionate creatures if you observe closely you will see pigs greet each other, gently touching snouts sometimes accompanied by soft grunts of friendliness or fondness but sometimes more amorous. Many consider that individuality is the prerogative of the human animal. In reality this is yet another erroneous misconception and one which many people have about other animals, particularly farm animals. It may surprise you that pigs, like humans, are unique individuals. Pigs like ourselves come in a whole range of emotions and characteristics, some are playful while others are more serious, some may be timid while others are more bold, some pigs are more resilient than others while sadly just like us some are highly sensitive and suffer with depression. Generally though pigs are highly sensitive and emotional animals. Many pigs confined in the cramped spaces of factory farms become seriously depressed, because they are intelligent creatures they are aware of their awful plight: the cramped space in pens where they can do nothing and can barely sit down nor turn round with nothing to occupy their intelligent active minds. As highly sensitive creatures pigs experience both positive as well as negative emotions and like us they are capable of feeling both happiness and sadness. “As happy as a pig in mud” is a saying often used to express how much fun someone is having. Pigs wallow in mud to keep cool and to protect them from sunburn but they also seem to enjoy the experience. Like all animals pigs experience pleasure and are playful. It is piglets in particular who love to play, in ways very similar to those of human children, such as frolicking, chasing one another, running in circles, squeaking and grunting in sheer delight, pretend fights and general rough and tumbles and exploring their environment. Play is for piglets as it is for children an important part of their development. Pigs also like “toys” such as an old blanket or cardboard boxes. Pigs will however soon tire of the same toy very quickly. Contrary to popular misconception pigs are clean animals they prefer bathing in fresh water rather than mud. Yes, pigs do wallow in mud as has already been mentioned above but this is done because pigs do not sweat, so in order to cool they take mud baths. In the wild pigs defecate away from their nests. The fact that pigs are forced to live in filthy conditions in their own excrement is amongst the many reasons pigs suffer with depression, along with confinement and lack of mental stimulation, when they are forced to live in factory farms and other conditions that deny them their natural inclinations. So when you hear any of the derogatory remarks often made, such as you are a filthy pig or this place looks like a pig sty, know that this is a misconception, for pigs are very clean animals. In fact pigs are so clean that they can be kept indoors like your cat or dog and make good companion animals. Furthermore the reference to pigs as a metaphor for gluttonous behaviour is also way of the mark. In fact given the opportunity pigs are very picky eaters, they dislike monotony, preferring variety they soon set aside food if the same food is offered to them each time. The idea that pigs eat anything without even savouring the flavour as is eluded to in the common expression “giving pigs cherries” is a misconception. Actually unlike a dog, pigs do not gobble up their food, rather they nibble, sniffing carefully to ascertain if they would like to eat the food or not. In the wild pigs spend a lot of time foraging for food, rooting for food with their highly sensitive snouts they are able to obtain a huge variety of foods including fruits, mushrooms, roots, snakes worms and even rodents. Again very much like ourselves a pigs body is composed of one to two thirds of water and therefore water is an essential part of their diet. Pigs are compassionate. This is an aspect of farm animals few ever know about, this is because we are now so removed from them. In the book the The Pig who sang to the moon by Jeffery Masson There is a delightful story told to him by Gene Bauston from Farm Sanctuary, an animal sanctuary in California, that tells a tale of friendship, compassion and emotional relationship between two pigs, Hope and Johnny. Hope had a seriously injured leg, for which sadly nothing could be done, and as a consequence her mobility was severely restricted. She had been rescued from a stock yard. Johnny and Hope formed a close bond. It may surprise you to know that pigs are not only compassionate but they are very forgiving, and even badly abused pigs rescued by farm animal sanctuaries appear not to hold a grudge and as you will see in the story below, are gentle caring sensitive creatures despite their mistreatment. Judy Woods, Director, Pigs Peace Sanctuary writes this about a very special pig. “As I sit and write this I gaze out the window and see Libby the pig in the pasture. Her nose is deep in the earth in search of a tender root. She walks off snacking on bites of sweet clover and having a care free day. From the moment she wakes up she is off deciding how her day will be spent. On hot days she is either close to the pond or in the early morning she makes the long walk through the meadow to the cool and lush woods to spend the day. If you came here and met Libby you might notice how calm and gentle she is; you might gaze into her eyes and see the look of a special friend. You might find that particular spot behind her eyes she loves to have scratched and then you might see her smile. There is yet another remarkable story of a very sensitive pig told in the preface of The Pig who Sang to the Moon, where Jeffrey Masson gives account of a remarkable pig who lived on a beach in New Zealand. Piglet as she was called was immaculate, well mannered, sensitive and intelligent friendly to everyone. Famous in her locality she was popular amongst school children who liked to sit at her side and give her tummy a rub. She enjoyed music, in particular the violin, especially on the beach at night when there was a full moon. “One of her guardians took a picture quite recently of her making the sweetest sounds during a night of the full moon, as if she were actually singing to the moon. The picture of Piglet singing is photographic evidence of her special affinity for music, water, night and moon. The above book is an excellent account of farm animal emotion, it includes information and anecdotes about pigs and other farm animals which after reading you are left with no doubt that pigs and other farm animals are truly sentient beings. Big Earl and Me: Richard Holye. I hope you will agree that pigs are amazingly complex animals capable of a whole range of emotions, they are gentle intelligent creatures who deserve to live out their lives according to thier natures, in peace and in freedom from fear and pain. Satya Oct 04: The Edgar Alan Pig Story by Pam Ahern. President Trump wants Congress to drastically cut federal support for food assistance to the poorest Americans by some 25 percent over the next decade. An astonishing 43 million of the US’s poor people rely on America’s Food stamp program, now called the Supplemental Nutrition Assistance Program SNAP. Most recipients live in households with children (about 72%) and more than a quarter live in households with seniors or people with disabilities. To make matters even worse Trump in a really devious ploy proposes to penalise (charge) retailers who accept food stamps. “Once again our country’s most vulnerable citizens are the target of President Trump’s brutal cuts. 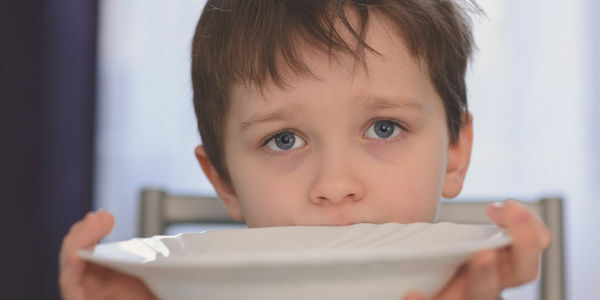 This time the it is the 43 million Americans that rely on the SNAP program – formerly known as the US Food Stamp Program – that could be hit hard. The Trump administration is proposing $191 billion dollar in cuts to the program over the next 10 years but what’s more he now wants to charge – read penalize– retailers for accepting the food stamps that often serve as a temporary lifeline for America’s poor. If you live in the UK the above rhetoric is very similar to comments made by the media here and implied by the Tory government referring to benefit claimants – including sick and disabled people and people who simply cannot get jobs because there are few jobs available too them – as scroungers fraudsters , parasites, skivers, work-shy, lazy, stupid, feckless with terms such as”handout” “something for nothing” . Note also like the UK many of the people who claim SNAP are working people whose wages are too low to support them sufficiently even to put food on the table. Yet another similarity is that cuts to Snap and other benefits are made in order to cut taxes to the rich. I cannot understand the mentality or the purpose of these constant attacks on the poor though of course the language of “scrounging” “parasites”and so on is meant to poison people’s attitudes to benefit claimants. Whether here or in the USA such treatment of vulnerable people is deeply unjust, grossly immoral and not worthy of any country that wishes to be considered civilised. To deny people enough food to nourish them when enough food is available is surely a violation of a basic human right. To go hungry even die while food stores are overflowing with an abundance of food is a great social injustice and frankly a crime against humanity. The US is a rich country, it is shameful that a government of millionaires led by a fabulously wealthy president sees fit to attack the most vulnerable of its citizens while giving tax breaks to the rich. Both here and in the USA it seems that poor people are under constant threat of cuts to their meagre incomes by the right wing governments that for reasons beyond my comprehension millions of working class people continue to vote for. Here in the UK once again the electorate which comprises mostly working class people (60% of Britons regard themselves as working class) return a right wing government to five more years of power, five more years of austerity: cuts to benefits for sick and disabled people, including the removal of mobility vehicles, cuts to the NHS , to schools and recently voting for a one percent pay rise cap for firefighters, nurses and other pubic sector workers, to name but a few of the austerity measures implemented by the present government. And we must never forget the latest casualty of austerity the Grenfell fire where well over 80 people lost their lives – though the final toll could be far higher – as result of cut backs and profits before people. I can well envision that if the Tories, propped up by the equally extreme DUP, continue their term in government for the full five years we will see an end to the NHS and universal free health care. I fear for our future and for future generations, the other species with whom we share this earth and the very earth itself. I can well imagine a world where the vast majority will have no or little food, shelter and the basics of existence while the tiny minority will live surrounded by obscene wealth supported by the labour of those who will barely have enough to subsist on. Furthermore as a result of automation there will simply be millions thrown on the scrap heap, their services not required eking out a living from a dying planet destroyed by the insatiable greed of the one percent – seemingly aided and abetted by the very people whose lives are detrimentally affected by the right wing polices of greed, inequality and social injustice which the electorate seems so keen to support. Trumps cuts to food stamps is not the only austerity measures which will effect poor people. Donald Trump will embrace hardline rightwing economics on Tuesday with a budget that proposes severe cuts to social safety net programmes while allocating $1.6bn to a border wall. Millions of people would lose access to Medicaid, the government insurance programme for the poorest and many disabled Americans. Food stamps for people on low incomes would be cut over the next 10 years under the White House plan and the families of undocumented workers would be frozen out of key tax breaks. Read about the history behind SNAP. Again similar to the UK the US is proposing to take a step back in time and undo all its social progress concerning welfare which again like the UK requires improvement rather than reducing its effectiveness, I can well imagine that both here and in the US such welfare programmes will eventually be dismantled after years of gradual cuts.